Who says I can't have flowers? Three weeks ago, Mr. L had an accident that dislocated his shoulder. In that one instant, our entire summer went on hold. Of course, we didn't know that at the time. We were unloading the car and he had hands full, and I had even more stuff I was lugging, and down he went on the front step. At first he said he was okay. He just needed to sit down. But then when 20 minutes went by and his arm still hurt, I convinced him to go to Urgent Care. We weren't even halfway there when he said, "I think I need to go to the ER." So the rest of the summer is now on hold. Even the garden, he said. Whoa! DEAL BREAKER! Okay, we can't put in the annuals we ALWAYS put in around the pool, but there was no way I was going to go the entire summer without flowers. Luckily, our perennials are blooming. 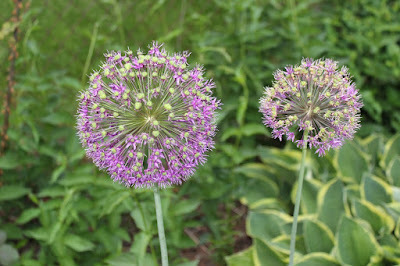 We've already had two of the rhododendrons bloom, and now our purple puff balls. (Allium.) Alas, we lost three rhodos and an azalea due to winter. But our clematis is thriving, despite the fact we got rid of our old arbor (where it kinda sorta lived) and built a new one (the white one above) just before Mr. L's accident. My brother helped us (well, me) put the stakes in so it won't blow away (again). (Okay, he did most of the work and I helped.) The clematis voluntarily climbed the fence (which it never did before and we always had to coax it to climb the old arbor) and is doing fabulous. I expect triple the flowers this year. 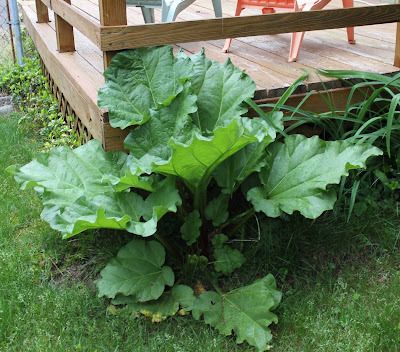 The only HEALTHY rhubarb plant in my yard. The rest are tiny. My mother had a HUGE stand of rhubarb and after she passed away last summer, I knew that if I didn't relocate some of it, I'd never have rhubarb crisp or chutney ever again. But I think I went to far transplanting it, because her stand is next to nothing this year, and only one of the five plants I relocated has thrived. The roses aren't doing much of anything yet, but I'm hopeful we'll have something beautiful to look at in the next month or so. 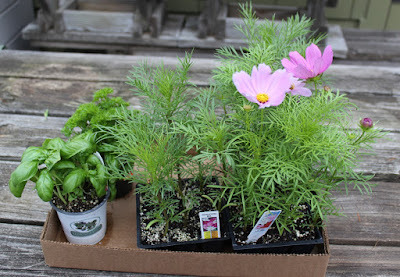 I knew Mr. L (who is a flower nut) would NOT be happy with no annuals, so on our errands Wednesday, I took us (since he can't drive) to two garden centers (calling them nurseries makes me think they'll be babies growing in the dirt) where we bought a bunch of stuff -- if we can't do the garden around the pool, we can at least fill our urns and big pots with flowers. Of course, there were a few stumbling blocks. 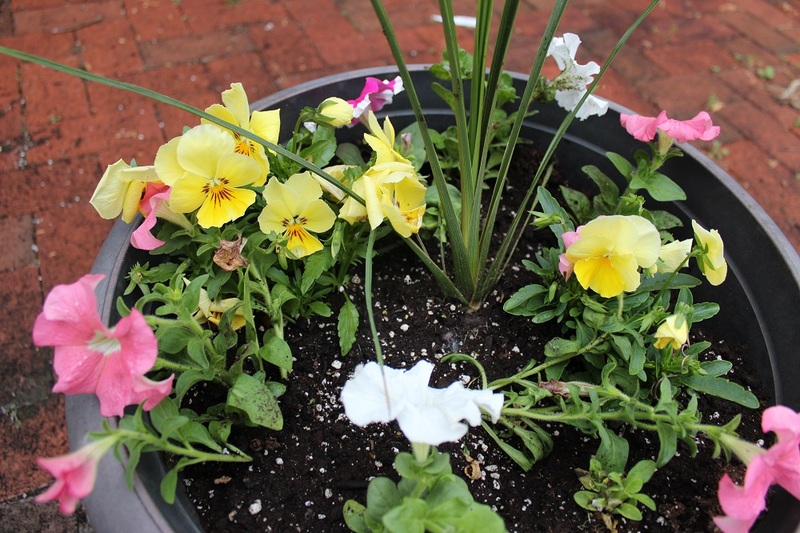 One of the pots had BEAUTIFUL yellow self-seeded pansies (from last year), and Mr.L wanted me to rip them out for petunias. (I LOVE pansies--much more than I love petunias, so in they stayed. I was, after all, doing all the work!) One of the pots had self-seeded lettuce, too. "Rip it out!" he said. Nope, I just planted the new seeds around them. So now we at least have flowers in our urns and when we sit in our enclosed porch, we can see the four urns filled with colorful petunias, pinks, nasturtiums. Aren't my self-sown yellow pansies GORGEOUS? The landscaper we use will come and weed the front and back flower beds (and oy! I had better sell a heck of a lot of books to pay for it), but we will have a tidy yard once again. But I can't wait the 2-3 weeks on their timeline. I will have to weed my veggie patch myself otherwise we won't be eating tomatoes until late October. But it will be a small price to pay. Although ... I'm giving up on certain plants because I can't bear it when the groundhogs, bunnies, and other critters eat them. This year I bought a single zucchini plant. 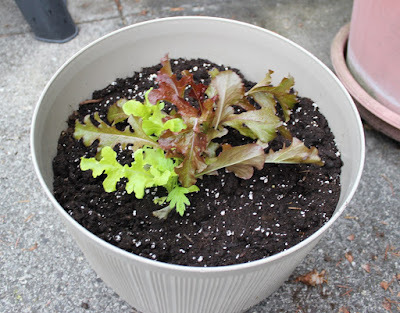 We'll see if it will tolerate growing in a container. Having flowers and enjoying them is a very simple pleasure in life, one I wasn't about to give up no matter what our circumstances. What have you got growing in your garden? I did a lot of my holiday shopping online. I also bought a bunch of clothes this fall ... again, online. Only now I'm being flooded with catalogs! At first it was fun getting all these wonderful catalogs and perusing the pages to see if there was anything I wanted, or anything I wanted to give as a gift. But then I finished my holiday shopping. I figured once the holidays were over I'd stop getting so many. Uh-uh. I'm still geting one or two a WEEK from every one of these outfits. Here's a place to do it: Catalog Choice. Last week I posted on Facebook that we caught a bunny in our Havahart trap. Presumably the bunny that has destroyed 75-85 percent of my bean crop. Never mind the woodchuck that has destroyed ALL of my gladioli, potatoes, coneflowers, and shasta daisies on the other end of the yard. I was surprised so many people were sympathetic to Mr. Bunny and not to my plants. Hey, plants deserve to live, too! Pity the farmer behind our house. 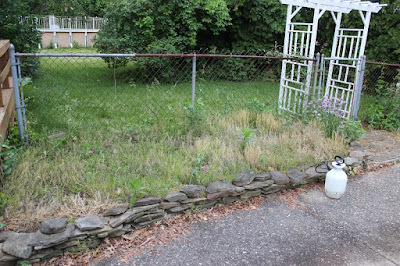 I estimate that the animals that have been having dessert in my yard have been dining three meals a day on his soil and have destroyed a very big portion of their crops. THEIR LIVELIHOOD. Yes, Mr. Bunny and Mr. Chipmunk (I found one munching one of my tomatoes last evening) are "cute" but they aren't Chip and Dale or Peter Rabbit. Give them skinny tails and they are what they are--RODENTS. RODENTS = RATS. Do you think rats are cute? Are tiny mice, so cute in fiction, sweet and nice when they are running around in your silverware drawer crapping on the forks and knives? Because I sure didn't think so last winter or in June when it happened again. RODENTS = DISEASE. The plague. The Black Death. Excuse me, but I don't find rodents in any form to be cute, nice, or Disney-esque. The bunny we caught in the trap was let go in a rural area. We did NOT kill it (unlike my rural neighbor down at the cottage who would catch critters in his Havahart trap and drown them in the bay--guaranteeing they would never eat his flowers and veggies again.) I'm perfectly fine with relocating them. But I'm not perfectly fine with them destroying crops, be they my own or my farmer neighbor's. I realize this attitude will not win me friends with those who read Beatrix Potter -- but I'm sure the lady farmer wasn't happy when these pests ate her kitchen garden, either. She just wrote about the "cute" side of rodents who wore waistcoats and spoke in full sentences--not squeaks that only a cat can hear. And that was her livelihood. Pity the poor farmer, already dealing with this year's intense weather conditions, who won't have money to feed his/her family this winter because not-so-cute rodents ate a big portion of his/her crop. I am an animal lover. (You wouldn't believe how much money I send to animal charities. And not just those for cats and dogs--but a farm animal rescue, too.) But I draw the line at crop-eating, disease-ridden rodents. This is just one subject where some of us just won't see eye to eye. I'm afraid we're going to have to beg to differ. I'm sure those in the rodent court have never planted gardens. Maybe they should try. I see a garden as eco-friendly and trying to limit my carbon footprint. I can't do that if rodents trump humans in this food chain. A few months back I bought my little kitchen composter. I decided I'd like to leave a smaller carbon footprint (especially since I don't have all that many Green lightbulbs in my lamps. There's something about the frequency of the fluorescent bulbs that hurts my eyes--especially when I read). I've been very happy with this little composter. I dutifully toss in my peelings and even corn husks (I do cut them up first, though). Instead of throwing nasty lettuce leaves into the trash, they go in the little white cannister. And let me tell you, the carbon filter does an excellent job of keeping odor at bay. It's been a tad warm here, and when I went to dump it yesterday -- well, let's just say I've smelled sweeter vomit. And that's what the big news is today. I finally have a real composter. Okay, it's not a commercial composter, because the ones I saw online were about $300. But when I posted that I wanted to have a compost pile, my friend of many years, author Lee Rowan, suggested I get a black garbage can with a locking lid, drill holes in the bottom, and use that as a cheap composter. So, off to Home Depot I went. That was a bit of an adventure in itself. "Where are your garbage cans?" "Inside the main door, to the right," says part-time high school girl at the garden shop register. Ask again--this time someone a bit less bimbo-ish. Find them, but they're kept outside, apparently in the bird poop zone. I had to do a lot of searching to find one that wasn't covered in ... do-do. 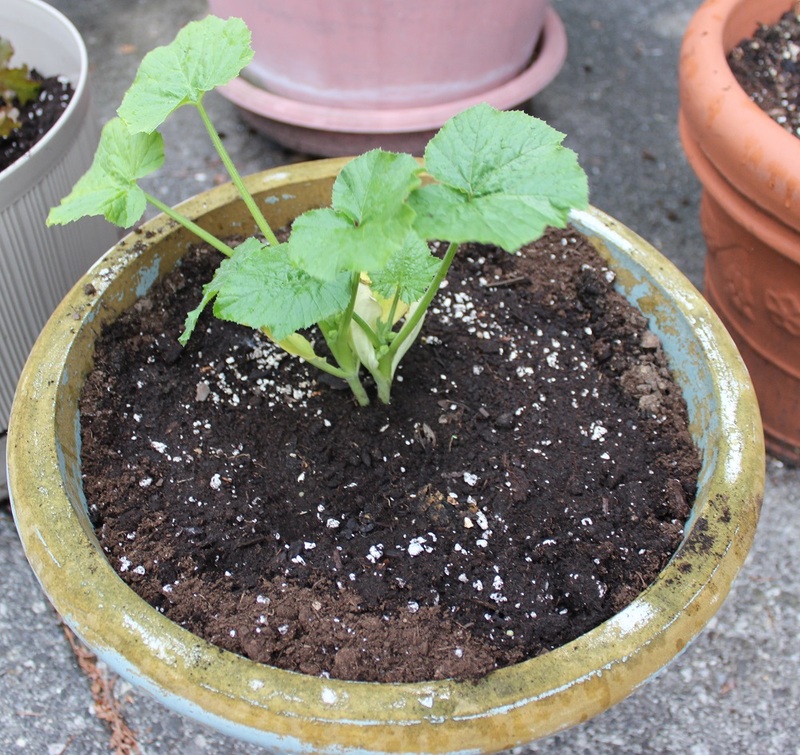 I decided to get a smallish one, because I wasn't sure I could create a lot of compost; I got a 20-gallon model. (And if I decide to move up, I can always just buy another one, right?) Lee was right, it wasn't a huge outlay of money. Just over $12. Home again, home again! Drill holes in the bottom, fill with garden weeds (which I just happened to pull yesterday), empty into it the contents of the kitchen composter (and the really disgusting zuchini I found in the crisper drawer) and voila! I'm composting. Hubby is happy because there's no unsightly pile messing up the backyard, and I'm making use of my kitchen (and garden) waste. Lee tells me if I leave the can in the sun and tip it around a bit, I'd have compost in a month. I'm not that eager. In fact, next spring will be soon enough for me. At least now I feel like I'm doing something really green. And my veggies will thank me for it next year by giving me a stupendous yield of tomatoes, beans, and potatoes. Well, a girl can dream, can't she? Last Christmas, my mother gave me money for Christmas. Not a fortune, but it was $$$ to treat myself to things I'd really like. So I bought some DVDs and the last of it sat in my little stash jar since about March. I couldn't decide what to do with it and then it came to me. I'll use it to buy a composter! New York State has decided that Amazon is making too much money off its citizens. So as of June 1st, Amazon MUST collect sales tax from New York residents. (They've told every major business the same thing.) Mind you, Amazon has no physical presence in New York, which has been the precedent for tax collection. So I have a feeling my Amazon orders will fall off as of now. I can order a book from Barnes & Noble and pick it up at my local store, and though I have to pay state tax (and the gas to get there), I can get at least 10% off the cost of the book (because I have a B&N saver card). I'll miss ordering on impulse from Amazon and I resent that New York is yet again sucking me for more tax income. There's a reason there's a mass exodus of people and businesses from this state. We pay too much and receive too little in return. Too bad I can't dump my compost on my local elected representative.